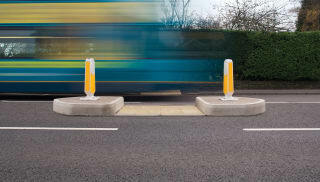 An essential part of the modern road layout, traffic islands can help guide drivers at busy junctions, help direct the flow of traffic and generally improve road safety. 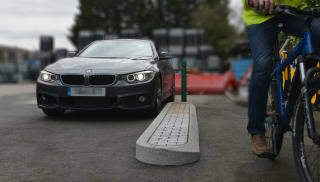 Browse Marshalls' commercial traffic island range now to find appropriate traffic calming measures for your project. Manufactured in reinforced concrete, Marshalls' traffic islands are a robust addition to the urban landscape. They’re available in two styles – the Satellite is designed for narrow roads while the Refuge is an ideal option for wide roads with high traffic volume. Both of these profiles can be either permanent or dismountable and come in a Natural or Conservation Silver Grey kerb finish. All of Marshalls’ traffic islands are compliant with the relevant Traffic Advisory Leaflets, Local Transport Notes and Highway Regulations. For further information, contact us with your requirements.